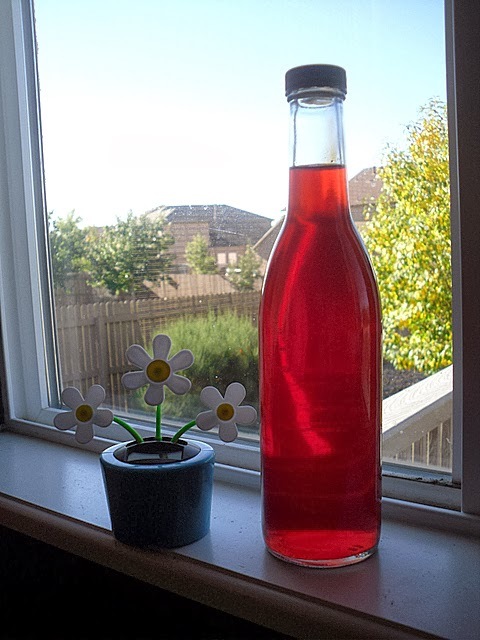 This is the first time I tried my hand on making the raspberry vinegar. It is actually very easy to make. 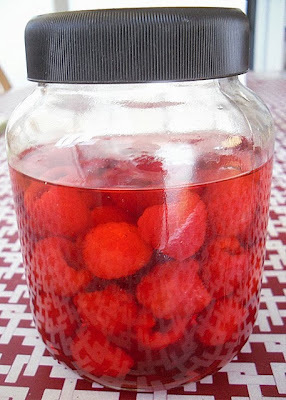 I bought too much of sour raspberries which resulted in this bottle of raspberry vinegar and while writing this post, it strikes me that I can use it to make red hue pickled ginger slices, not bad at all. :-) As it is all natural!! When I read through the ingredients list in the store-bought version, I saw that they used red coloring. I was like what a bummer, here's go another convenient store-bought product for me. Hence, this raspberry vinegar came in handy as I can use it to pickle some ginger slices in this beautiful red vinegar to get the red color hue ginger slices for sushi or "Yu Sang" during the Chinese New Year. I already have a bottle of normal pickled ginger for potstickers/ pan-fried dumplings, now I will have another bottle of red hue pickled ginger for "Yu Sang"! It can last a long time when kept refrigerated. As both ginger and vinegar are good for us, you can definitely have a little bit of this each day with your meal. Here it is, I made this couple of days later after my draft. 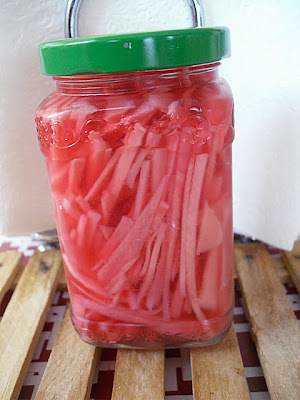 This was day 1 pickled. I keep it in the refrigerator. Recipe inspired by Monica from the theyummylife.com. Add cleaned raspberries into a glass bottle. Top it with vinegar. Close the lid and set it away in a cool, dark place for 2 weeks. I put it on the floor in my dark pantry. After 2 weeks, drain and strain the vinegar into another tall glass bottle, close it and keep refrigerated. 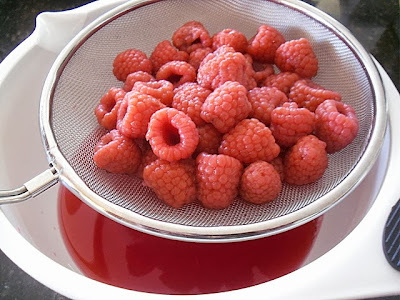 Throw away the raspberries. Ready to use in any recipe that calls for vinegar! Raspberries salad dressing would be nice too! That looks so easy and the colour is beautiful! It really does look easy and without artificlal colouring too! What are you going to create with this?